Pumpkins and Fall Activities will not be available in 2010. 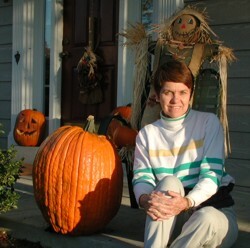 I am especially appreciative to our loyal Pumpkin and fall decoration customers who helped make 2009 a record breaking year despite record rainy weather conditions. Unfortunately, the growing popularity of our pumpkins and the associated activities like the Straw Pyramid, Gold Mine, Diamond mine, corn maze, sorghum maze ...etc. has put a tremendous strain on my ability to manage these activities at age 70 without sacrificing considerable family life in the process. Current plans for 2010 are to eliminate all pumpkin/squash/decorative corn plantings and all fall related activities. Our web site has a list of other pumpkin farms in the area you may find useful.